THE RAFFLE HAS NOW BEEN DRAWN AND WE HAVE A WINNER! I HANDED THE AFGHAN OVER TO LUCKY HENRIETTA ON 11/12/12 AND I WOULD LIKE TO THANK EVERYONE WHO DONATED. OF COURSE YOU CAN STILL DONATE, BUT REMEMBER YOU WON'T BE ABLE TO WIN. THANK YOU!!! 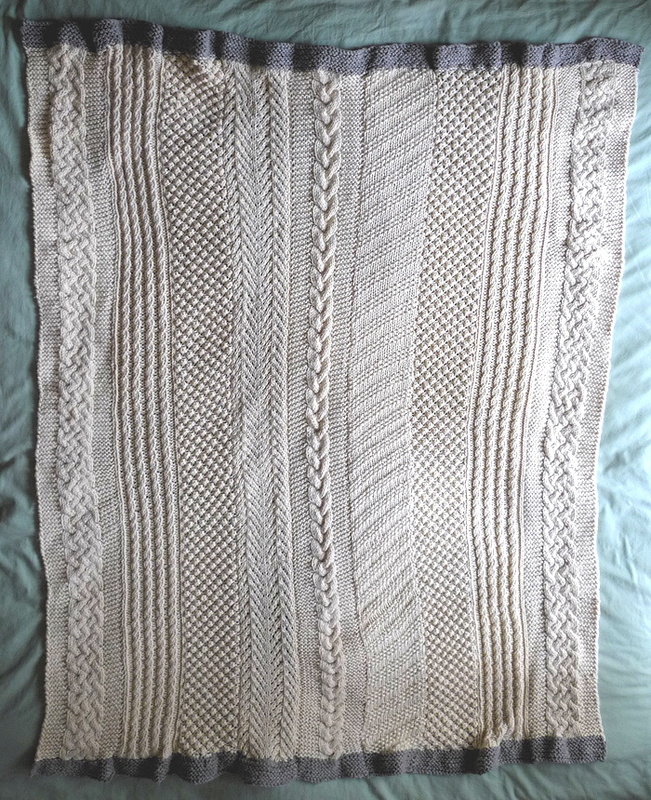 I'm raffling off this Afghan that I created for my second book Knitty Gritty - The Next Steps. The money raised will go to the Genesis Research Trust to help with their promotion of science for the health of women and babies. I'll draw the winner (with great fanfare) in Autumn 2012 after the book is released. The Afghan is approx. 160cm by 130cm, used about £200-worth of Rowan Sheep Breeds natural wool and took 300+ hours to knit! Here's a photo of it fully laid out. It is sure to keep you snug as well as stylish. As some of you know, I've recently finished writing my second book, Knitty Gritty - The Next Steps which will be out in August 2012. This was a huge labour of love (I do mean blood, sweat and many many tears) for me and I wanted the project to culminate with something special. Out of all the thousands of hours of knitting I and my amazing test-knitters did, one of the most painful projects for me was the Stitch Library Afghan knitted to show the use of several different knitting stitches in one Afghan. Ok...to share something comic/tragic...during the writing of this book, I became allergic to wool! Yes, yes please take a minute to laugh...you couldn't make it up, a knitting teacher allergic to wool! Hmph : S Basically any very naturally woven fibre makes me sneeze uncontrollably and makes my eyes stream and turn red. I didn't keep this in mind when I started on the Afghan and ended up knitting most of it wrapped up to keep warm but with all the doors and windows open to give me the most ventilation. The Afghan is knitted using the gorgeous, but very natural Rowan Sheep Breeds. Lovely yarn but my poor allergies did not agree! I kept at it as I could see the beautiful Afghan growing into something special. And as the project drew to a close, I knew I could never keep the Afghan for myself. As lovely as it looks and feels, it's completely impractical in the home of a sneezer! About £200 worth of yarn. 300+ hours of work. What to do? So I decided to raffle off this Afghan for the good work done by the researchers at Genesis Research Trust. I hope that through my work, tears and sneezes some good will come...with your help of course. If you can please enter your donation on this Just Giving page. When I reach my target goal of £1001, or when Knitty Gritty - The Next Steps is released (Aug/Sept 2012) I will have a raffle draw and the winner gets the Afghan! Don't forget to put your contact details or email me direct once you've donated or I won't know to add you to the draw (if you donate anonymously). Also please click the Gift Aid box if you are a UK tax payer so we get an extra 25p per £1 on your donation. Oh and there will be some runners-up prizes (yet to be decided on). Please feel free to forward this onto anyone you think might be interested. Donating through JustGiving is simple, fast and totally secure. Your details are safe with JustGiving - they'll never sell them on or send unwanted emails. Once you donate, they'll send your money directly to the charity and make sure Gift Aid is reclaimed on every eligible donation by a UK taxpayer. So it's the most efficient way to donate - I raise more, whilst saving time and cutting costs for the charity. Women for Women Events raise funds to support the work of Genesis Research Trust. Genesis Research Trust finances vital medical research into the causes and cures for conditions affecting women and babies. These include cancer, miscarriage, stillbirth, premature birth and brain damage.